Thursday October 18th 1923 I was sewing all day remodeling my green silk dress. I went with Otts folks to Presbyterian church to supper. Hattie busy till noon. They went to a P E O meeting in PM and she to church. weather cooler. Friday October 19th 1923 We went to the depot to meet Robert Jellison who came with Will & Emily Bremner in their car. William and Mary came last night. After I came home did some washing and had it ironing by four oclock. Letter from Warner McCall. Rode to town before supper. Saturday October 20th 1923 We went to town with Cora in the car to see The Home Coming Parade. It is a fine day for the events. They all went to the game between Iowa and Illinois but myself. Ill won the game. I was sewing today. Sunday October 21st 1923 Hattie and I went to church with Ott. All the folks from Byingtons were here for dinner. Norma had a nice meal ready for us. Will & Emily Bremner started home at 2.45. William and Mary here later with Robert by way of Cedar Rapids. read in evening. 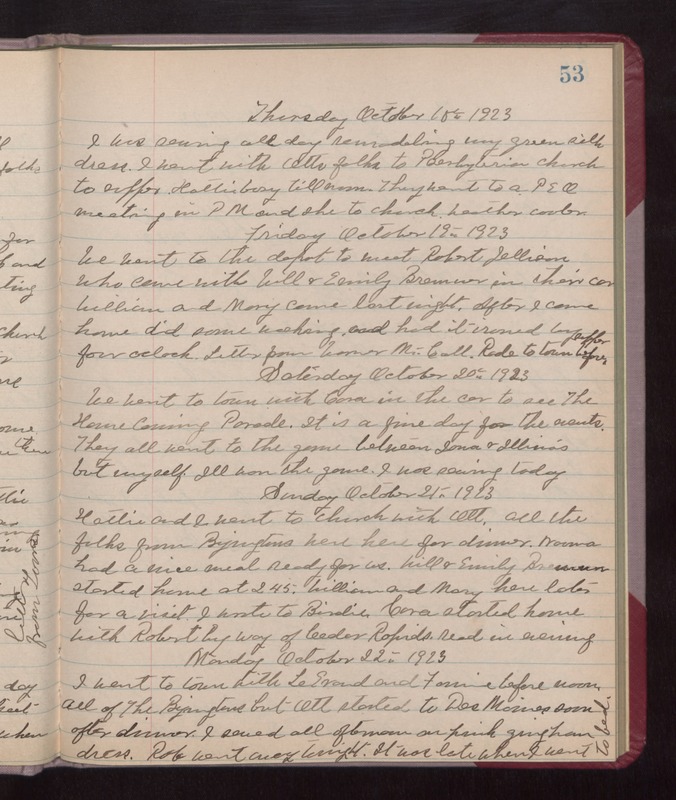 Monday October 22nd 1923 I went to town with LeGrand and Fannie before noon. All of The Byingtons but Ott started to Des Moines soon after dinner. I sewed all afternoon on pink gingham dress. Rob went away tonight. It was late when I went to bed.